While Myrtle Beach, South Carolina, is a great destination for Calabash-style seafood and Southern comfort food, it is not usually known for its top-chef restaurants or its award-winning cuisine. But with rumors of an up-and-coming food and wine culture, I decided to check out two of the recently acclaimed restaurants along the Grand Strand (the designation for the 60-mile strip of beach towns north and south of Myrtle Beach proper). What I discovered were two hidden gems that satisfy my criteria for some of the best upscale food in the South. 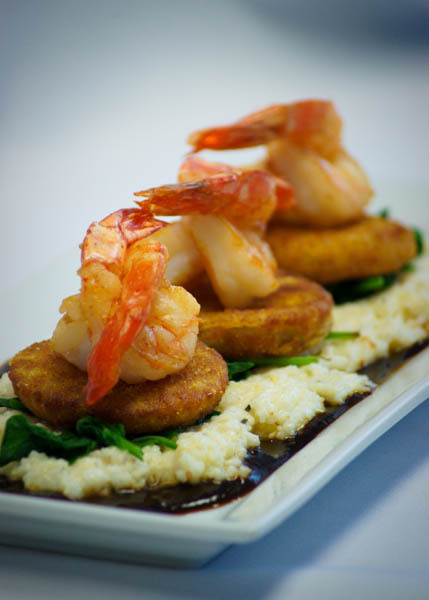 Located in Little River, SC, along the north end of the Grand Strand, The Brentwood Restaurant & Bistro is well known to locals for its Low Country French Cuisine. 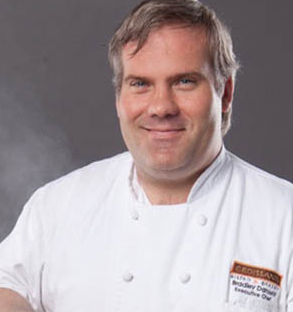 Owner and Chef Eric Masson prepares creative dishes with an emphasis on seasonally fresh ingredients. 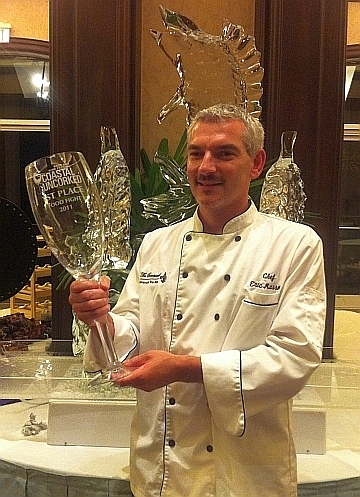 A French native, Masson holds three culinary degrees including one from the famous Ferrandi Culinary School in Paris where he graduated in 1993 with honors. Arriving at the Brentwood, which is located in a beautiful Victorian home (circa 1910), I discover five cozy dining rooms with fireplaces, including a private party room for wine tastings and events, two bar areas cleverly wall-papered with corks from their very own wine collection, and a friendly staff who couldn’t wait to fill me in on the history behind the Brentwood Restaurant & Wine Bistro. The house itself has an interesting background that includes an owner who rented rooms to fishermen in the 1940’s for $1.00 per night. In the 70’s, the house was moved across Route 17 (the main drag along The Grand Strand). Closed in the 80’s, it was vacant until the Stublick brothers from Brentwood, Long Island (hence the name Brentwood Restaurant) purchased it and took the art of cooking to the highest level. When they were ready to retire thirteen years later, they searched for the right person to take it over. Eric and Kimberlee Masson from Saratoga Springs, New York, fit the bill perfectly. With experience in restaurants in London, France, Switzerland and the New York area, Eric and Kim headed south to their favorite vacation spot in Myrtle Beach where they fell in love with the Victorian style house and took over the business in August 2007. “My wife and I really enjoy running The Brentwood Restaurant,” said Masson. “It is an historic mansion full of charm located in the quaint village of Little River. I love that I can source all of our seafood locally and grow vegetables in our backyard.” But what Masson and his wife didn’t know was that they were purchasing more than just a beautiful Victorian house. “I remember a night when things started moving around by themselves,” said Masson. That’s when he realized that the house was possibly haunted. Employees love to tell guests stories of things falling off the walls and of a non-existent little girl seen running between rooms in the house. In fact, the activity was so prevalent that on January 30, 2010, with a full moon lightly hidden behind the dark clouds, the local paranormal investigation team known as The P.I.T. Crew spent the night researching the Brentwood Restaurant & Wine Bistro. With or without all it’s charming history and ghost stories, the restaurant is a gem with its extensive dinner menu offering La Carte selections; Le Menu Paris (four course “Prix Fixe” Menu; the Chef’s Seven Course Tasting Menu and Gluten Free, Vegan and Vegetarian selections. Brentwood also offers over 100 wines from all regions. In addition, they feature a Reserve List of “Big Reds” from the Bordeaux, Bourgogne, Rhone Valley and California regions. 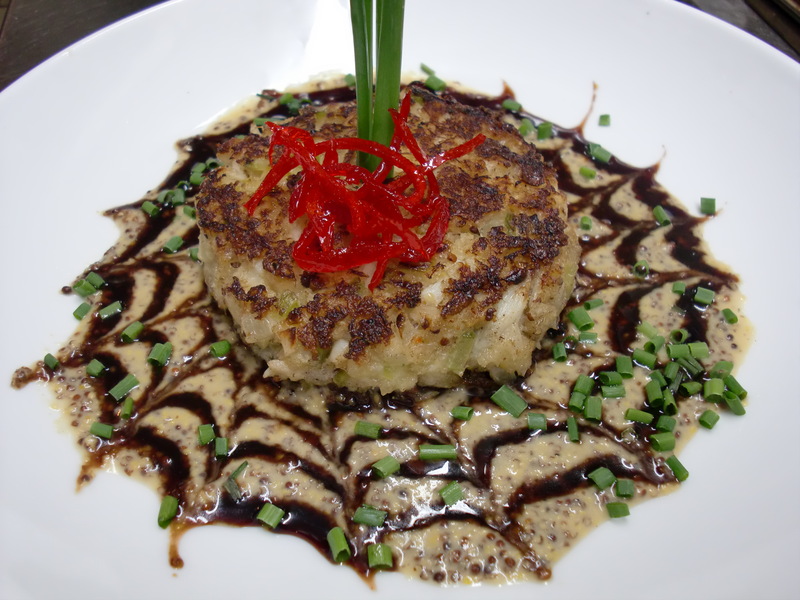 My husband and I began our “French dining experience” with two Southern favorites–the Low Country She Crab Soup and the Crab Cake Dijonnaise. For the main course, I choose the Cote de Boeuf (the Cadillac of steaks) with potato du jour and sautéed vegetables with Béarnaise sauce. My husband ordered one of the evening specials—the Beef Wellington. Enjoying the blazing fireplace, the wonderful selection of wines, and the leisurely pace of the evening, we finally arrive at Les Dessert menu. Belgian Chocolate Mouse, Crème Brûlée a la Orange; Panna Cotta Foster and Strawberry Romanoff are just a few of the choices we have. 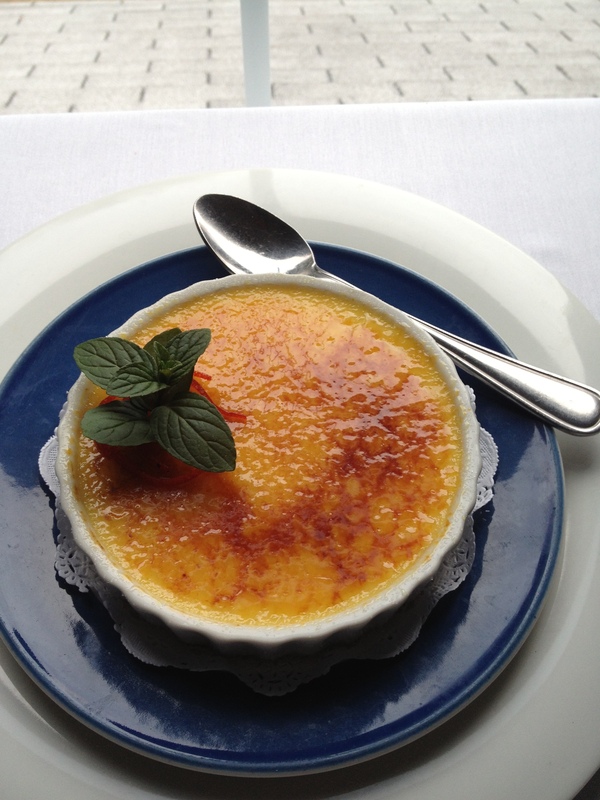 Since my husband and I usually split dessert, he leaves the final choice to me and so the winner was the Crème Brûlée. Secretly, I was wishing I had started with the Dessert Menu first! In addition to dinner, the Wine Bistro offers a daily Happy Hour with wine specials; a wine club that meets twice monthly, cooking classes for groups of 8 to 20 guests and other special events. Chef Masson is currently writing a cookbook and planning an outdoor patio as well as a gift shop in the restaurant for 2014. Check out their website for exclusive recipes by Chef Masson. Vukov and her pastry chef, Heather Cameron, continue to design and bake birthday cakes, sculpted cakes, cupcakes, macaroons, pastries, cookies, brownies and breads used in the restaurant. But what they are best known for are their wedding cakes. Over the years, Croissants has won several awards, including two recent prestigious national awards recognizing their excellence in wedding cake design and execution. These awards include: 2014 winner for the best wedding cake bakery in The Knot Best of Weddings, as well as the 2014 WeddingWire Couples’ Choice Awards winner. In 2012, Vukov expanded her bakery, breakfast and lunch offerings into a French-Southern-fused dinner bistro and relocated the restaurant to its current location at 3751 Robert Grissom Parkway. 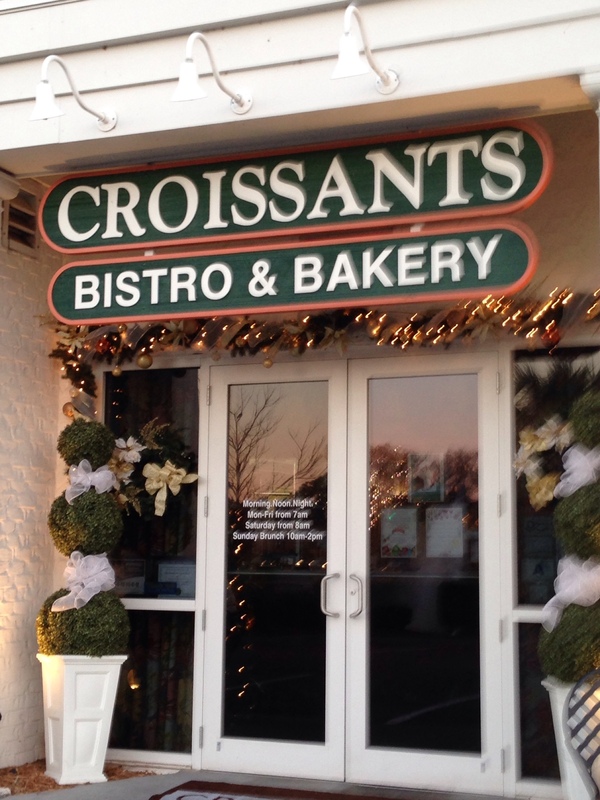 Croissants Bistro & Bakery was now able to offer weekend brunch, catering, and wine dinners. A graduate of Le Cordon Blue Culinary School in Orlando, Florida, Daniels worked at restaurants in Florida, Tennessee and Savannah, GA, before moving to Myrtle Beach. “My mom is from Alabama, so I’m a product of Southern cooking,” admits Daniels, “but I just do it a little differently.” Chef Daniels’ unique way of infusing southern comfort food with more eclectic dishes is just one of the reasons The Myrtle Beach Hospitality Association named him “Chef of the Year” in 2013. Arriving at Croissants for dinner, my husband and I were escorted to a charming corner table in the small, yet cozy restaurant. Selecting from the many menu options was difficult, but my husband and I finally decided to begin our dining experience with something unique—the Carpet Bagger Brie (Brie cheese and fig compote wrapped in puff pastry). For our entrees, my husband ordered the Scallops and Ahi Tuna with Wasabi Mashed Potatoes, while I enjoyed their signature dish of Shrimp & Grits, topped with a black BBQ sauce (secret ingredients include Guinness, coke and dark molasses sauce). And since I’m a true chocolate lover, it wasn’t difficult to decide on the Triple Chocolate Mousse for dessert. Croissants Bistro & Bakery is recognized as part of the “Fresh on the Menu” program of the South Carolina Department of Agriculture for its use of South Carolina local produce in menu items. Croissants is committed to utilizing fresh local seafood including grouper from Murrells Inlet, shrimp from Little River and Georgetown, and clams and crabs from Bull’s Bay. In addition, their cheeses and fresh vegetables come from local farms and vendors. Croissants Wine list features over 100 wines from all over the world, with over twenty wines available by the glass. The Wine List has received the Wine Spectator’s restaurant Wine List Award for numerous years. To earn such an award the wine list must consist of a well-chosen selection of quality producers, as well as a thematic match to the menu. Throughout the year, Croissants also hosts wine dinners with food pairings and Art and Wine tasting events. Vukov loves to give back to the community, which is one of the reasons she was named 2012 South Carolina Restaurateur of the Year by the South Carolina Restaurant and Lodging Association. Vukov worked tirelessly to create a food and wine event in Myrtle Beach called “Coastal Uncorked Food & Wine Festival.” Beginning in 2009 it has become an annual event, which is now operated by the Myrtle Beach Hospitality Association. This event is helping to establish Myrtle Beach as a culinary destination both locally and nationally. Loved the article! Definitely plan to visit both of these locations when I am in Myrtle Beach in April.